Home » Economy » U.S. Economy » Inflation Is Staring You in the Face. Are You Prepared? Inflation Is Staring You in the Face. Are You Prepared? I’m a natural contrarian … and today, I’m going to contradict myself. Last week, I wrote that it’s imperative to plan your future based on value, not price. But prices matter too, especially in the short term. For example: Is bitcoin so valuable that it deserves a price of $11,000? 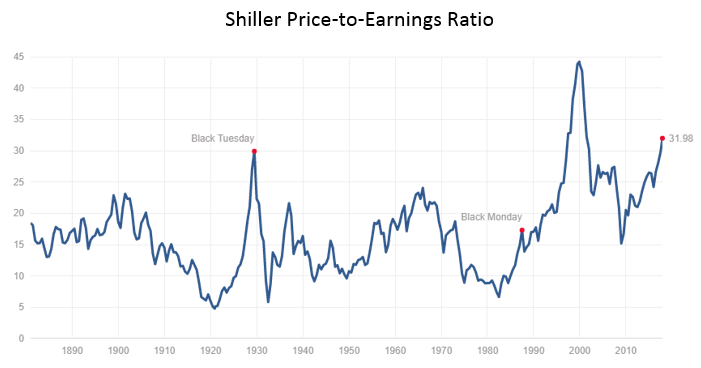 Are U.S. corporations worth so much that they deserve the second-highest Shiller price-to-earnings (P/E) ratio in history? 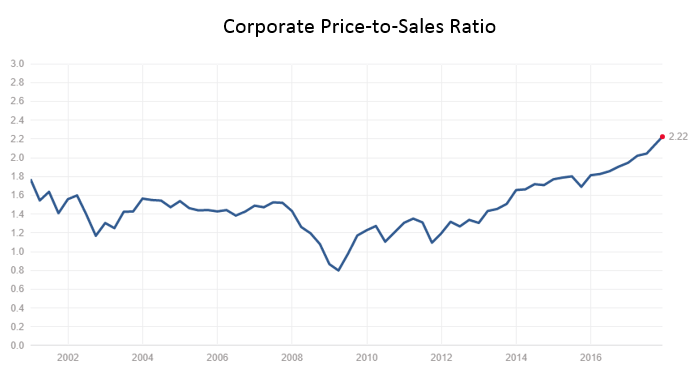 Do those corporations deserve a price-to-sales ratio 75% above its historical average? In all three cases, the prudent answer to the question is no. 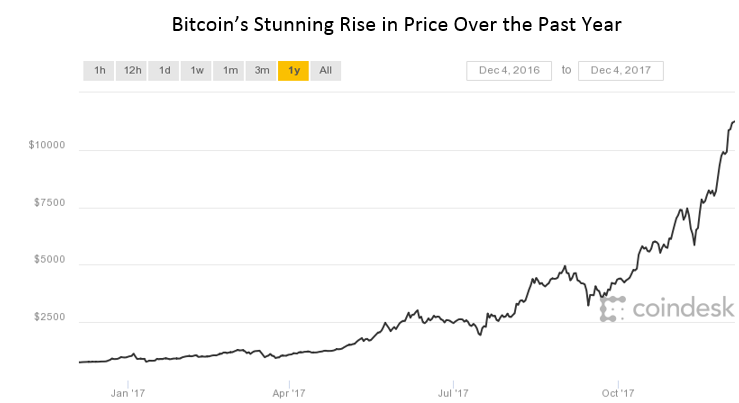 The prices of bitcoin and stocks are out of line with their value. But I’ve been saying “no” to another price-related question for the last nine years … and prudence tells me it’s time to change my answer. It’s time to get ready for consumer price inflation. Are you? No inflation. No crash. Just as I predicted. Monetary theory says that the average level of prices is set by the total money supply divided by the real output of the economy. If money supply grows faster than output, inflation ensues. Given the big gap between the growth of the economy and the growth of liquidity, we should have inflation. But contrary to the misleading slang term, central banks don’t “print” money. Instead, they create reserves for the commercial banking system. Money is only created when banks make loans against those reserves — say, $10 lent out for every $1 in new reserves. If those loans aren’t forthcoming — or if they go to something other than consumption or investment — there’s no new money in the real economy, and no inflationary pressure. At least not in the consumer economy. What the dollar-doomsday crowd didn’t get is that QE is a peculiar sort of liquidity. QE involved central bank purchases of bad debt held by banks from the pre-2008 housing bubble. Taking those debts off the banks’ balance sheets had the effect of boosting their reserves. Of course, banks could have used this improved position for consumer or corporate investment loans. That’s what the politicians and bankers kept telling us. That would have created more real-world money, and increased consumer inflation. But, in the case of lending, supply doesn’t create its own demand. On the other hand, weak consumer demand meant corporations had no interest in borrowing to fund investment. In fact, corporations used the financial crisis to cut costs — firing workers and foregoing investment — which boosted their profit rates and gave them loads of cash, even as sales were flat. So where did all that cash go? What about the QE money? What happened to inflation? Since QE money wasn’t going to Main Street, it went to Wall Street instead. The average annual return of the S&P 500 is 7%, net of dividends. Since 2009, it’s been about 15.5%. Things have changed since 2009. The economy is growing at 3% and nearly at full employment. After a decade of trying to claw it out of Wall Street and corporate coffers, ordinary people are finally starting to get their hands on some disposable income. Accordingly, seasonally-adjusted consumer inflation just hit 2.0%, the Fed’s target. 1. Tax cuts will fuel inflation, not investment. There is already talk of workers at U.S. corporations demanding the wage increases promised by President Trump and the GOP. More money in the consumer economy will increase demand, leading to more hiring, and thus wage inflation. Wage inflation will lead to price inflation, and vice versa. 2. The Fed will raise interest rates more rapidly than it would have without the tax cuts. But it will be under intense political pressure to limit those increases to keep the economy hot. Fixed-income investments will continue to perform poorly, even as your cost of living rises. 3. Gutting the Consumer Financial Protection Bureau (CFPB) will lead to more reckless lending, and thus more money in the real economy, adding fuel to the inflationary fire. 4. The enormous firehose of cash from slashed corporate tax cuts, tax cuts at the top of the income ladder and repatriation of foreign profits will continue to push the most dangerous inflation of all — the stock market bubble — to new heights. Until, one day, it doesn’t. Inflation, weak fixed income performance and a growing asset price bubble. Are you ready for that? If not, you need to consider a safer strategy now. Editor’s Note: Don’t miss your chance to attend the special Precision Profits Investment Summit, hosted by Michael Carr, CMT, and Jeff Yastine. We are closing registration for this limited event at midnight on Tuesday. For full details and to claim your spot, click here. « Previous Are the “Good Ol’ Days” of the Yield Curve Ever Coming Back?